5 Bedroom Detached House For Sale in Stone for Offers in excess of £575,000. The outside comprises substantial driveway leading to garaging/outbuildings, orchard, wooded area and field. Outbuildings would be ideal to convert to stables. Note: This property lies within an area that may be affected in the future by HS2,, we would refer you to the HS2 website for further information. Open porch area leading to the front door. Stunning open plan hallway which leads directly through to the kitchen/breakfast room, stairs to the first floor, access to lounge and utility room. Superb breakfast kitchen with a range of wall and base units with work surfaces over, incorporating sink unit with tiled splashbacks, space for range cooker with cooker hood above, space for fridge freezer, stand alone island, wood effect floor, radiator, two double glazed windows and door. Spacious lounge with fireplace, radiators and two double glazed windows and doors to conservatory. With space for appliances and window to the front. Ideal boot room. Located off the utility room, with low level WC and wash hand basin. With double glazed window, radiator and door to en-suite. With corner bath, low level WC, pedestal wash hand basin and window. Spacious bathroom with panelled bath, low level WC, pedestal wash hand basin and tiled shower cubicle, heated towel radiator and window. With front garage door, side door and door leading into hallway, an ideal room for conversion, subject to the necessary planning and building regulation consents. The property is access via a shared driveway which leads onto a private drive giving access to the integral garage, and central lawned island with hedging. To the rear there is a lawned garden with patio area providing a superb terrace for entertaining and relaxing in the summer months. 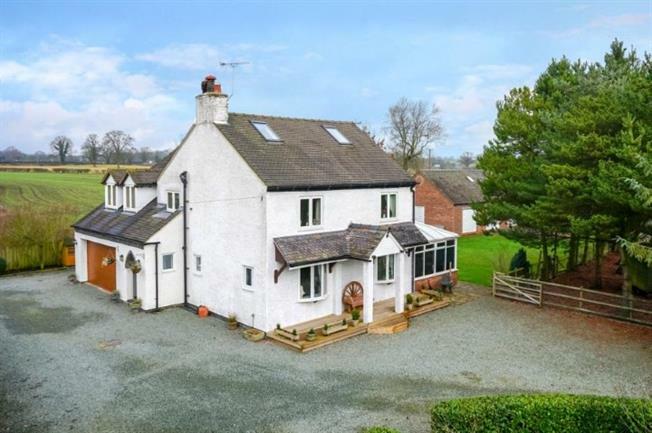 The driveway extends beyond providing access to the detached garaging with steps up to a mezzanine floor and a further range of outbuildings comprising of a spacious barn and two workshops which could easily be converted into stables, if desired.